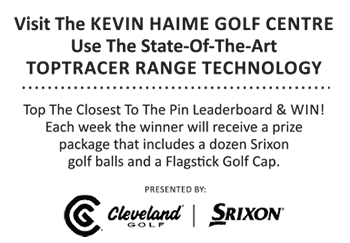 (Kanata, Ontario) – Round 1 of the PGA of Canada – Ottawa Zone Championship on the Flagstick.com Players Tour is in the books and it appears that the golf course was the winner today. Nobody broke par on the Kanata Golf Course that was in excellent condition on a near perfect day with only a slight breeze moving the sponsors’ TaylorMade and Adidas flags stationed at the first tee. Ottawa Zone Golf Professionals were quick to praise the golf course conditioning and most blamed their scores on their own swings not being up to par. The senior professionals were first off today and after their scores were posted we had a tie for first place at 4 over par 74 between Prescott’s Thom Miller and Sand Point’s Steve Hall. Defending Zone Champion Lee Curry from the Camelot Golf & Country Club posted a two over par round of 72 that was tied by Dan McNeely from Smiths Falls. Round 2 of the Zone Championship begins at 9:33 on Monday morning at the Kanata Golf & Country Club which is celebrating 50 years of operation in 2018. The final group will go off the tee at 11:40 and spectators are welcome. If you would like to watch local golf professionals at play or if your Club’s golf professional is playing, drop by and them your support.